For armchair travel via time machine, there's no beating James A. Fitzpatrick's Traveltalks. From 1930 to 1954, this prolific producer filmed hundreds of Technicolor shorts all over the globe. I missed seeing the first two Warner Archive volumes of these fascinating little films, but very much enjoyed the 66 shorts in the recently released volume three, which covers the years 1940 to 1953. The three disc set literally goes all over the map, even from film-to-film. If you sit down to watch several shorts in one sitting, you can go from Brazil and New Zealand to the Andes and the Taj Mahal within an hour. In a world where jet set travel had not yet reached its peak, and focus was on World War II and postwar recovery, seeing places like these before the nightly matinee must have been stunning. Today the films still impress, though more for the efficient time capsule they provide. The Traveltalks recall life at a slower pace. There are fewer cars and people, and you can even see that the cities have cleaner, clearer air. Overviews of big cities like Chicago and New York are juxtaposed with scenic shots of National Parks and natural wonders, the urban spots in particular almost appearing to be from another world because of the distance of time. Fitzpatrick kept his subjects at arm's length, choosing long shots over close-ups. You are more likely to see group shots and scenery than anything to provide true insight into a culture. The films are essentially a peaceful and jolly catalogue of places and activities. You do not see the stress of a rural farmer or a busy city dweller. 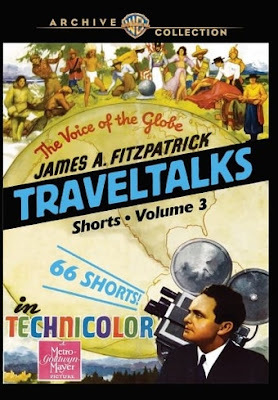 For the most part the Traveltalks series ages well because Fitzpatrick is a fairly straightforward narrator, avoiding jokes or asides that could date the material. There are moments of racial insensitivity and exoticism of foreign people, but they aren't as glaring as other travelogues I've seen from the time. The films show their age and the images aren't sharp, but the warmth of the Technicolor does much to make viewing the shorts a pleasurable experience. I found it a soothing experience to pop these DVDs in the player and take an easygoing trip around the world. Many thanks to Warner Archive for providing a copy of the film for review. This is a Manufacture on Demand (MOD) DVD. To order, visit The Warner Archive Collection.